Shares cost $100 each per month, and you can buy just one or as many as you like. We’ll bill you electronically via Square at the first of each month for $100 (no additional fees will be added). You’ll receive a 10% bonus ($10) each month for each share, no strings attached. This stretches your buying power by $10 every month! Use your share however you like, on whatever products we currently have in stock. You can use all accrued credits at one time, once a month, or however you choose. We’re flexible! Pickup your goodies at any farmer’s market, on the farm (by appointment) or via free delivery (restrictions apply). If you go over your share amount in a three month period, we’ll simply collect the difference at the normal retail price. Each share you sign up for will last three months, costing a total of $300 that will be good for $330 in farm credit. You can stop and restart anytime after your three months are up, or just sign up again to keep the savings going all year long. Jump on board at anytime to start saving! If using a farmer’s market to collect your goodies, products must be picked up at the same location each month for record keeping purposes. You can choose from any products currently in stock (sorry, no rain checks). All credits must be used by the end of the third month. Any share credits not used will expire at that time and are not redeemable. You can pre-order online using our order form, or simply show up and let us know what you would like (you’ll be limited to what we have on hand if at a farmer’s market). For large distributions in excess of $100 retail at a farmers market, a pre-order via our website or thru email is REQUIRED. Credits can be applied to regular retail pricing and discounted retail items. They can not be used towards bulk purchases (half and whole animals, chicken CSA, etc.). At the farm by appointment (year round). Welcome to our 2018 Chicken CSA information page. We have quite a few changes for the CSA this year, so please read carefully! Logistically, the chicken program is mostly going to work the same this year as in years past, albeit with three pickup dates (June 14th, July 16th and October 8th) instead of four pickup dates. One big and positive change is that we are switching to a certified organic grain for all of our poultry this year. For years, we have been committed to only using non-gmo grains which has set us apart from other local area farms. But we are taking things a step further this year, because we care about the health of both our customers and our environment! Chickens will be priced to the CSA at a flat 10% discount off of our retail pricing (moving up from $4.99 to $5.49/lb), so the CSA price will be $4.95/lb. This will equate to roughly a $3-$5 increase per chicken from last year. The cost increase is mostly related to the increased production costs by switching to organic grain. You can order as few or as many chickens as you would like (from 15-40) in increments of 5. Our goal is to raise slightly larger chickens than last year, so please keep that in mind when ordering if you are on the fence about ordering 5 more or 5 less. Our average whole chicken weight this year will be between 5-5.5lbs. You’ll place a $10 deposit per chicken now to lock in your spot (via a check or PayPal), then pay the difference at each pickup for birds taken that day. There will not be one big single balloon payment in May like years past. Example: You order 30 chickens and place a $300 deposit now. You’ll pickup 10 chickens on each of the three dates. When you arrive we’ll grab 10 birds, add up all the weights and take $4.95/lb x the total weight. We will then subtract the deposit for the birds you are taking that day (in this case 10 birds x $10 deposit = $100) from the total and collect the difference. So you’ll pay something each time you come to the farm. You will still get to save 10% on any other items you purchase on farm the day of pickup, including beef, pork and additional poultry. If you choose 30 or fewer chickens you can choose to get all of your CSA birds in two trips, or one trip if you choose 20 or fewer birds. The chickens come whole, or you can elect to have them cutup for a small fee. Simply let us know how many of your chickens you would like to have cutup at each delivery date. Note that each chicken will be cut into the following pieces and placed into one bag: 2 breast, 2 thighs, 2 drumsticks, 2 wings, 1 frame. You can then separate your pieces to fit your needs and freeze them. Cost per cutup chicken is $2.00/each. Discounted Holiday Bundle Boxes Are Back! Have you ever wanted to sample a whole bunch of our various products? What if you could buy an assortment of our authentic, pasture raised meats at a nice discount? And to top it all off, what if we brought it to your door with FREE delivery anywhere around Indy, Bloomington, Greenwood, Franklin, Mooresville or Martinsville? If that sounds good to you, then now is your chance to try out any one of three special packages we are offering this holiday season. And don’t get one for just yourself, consider sending one as a unique Christmas gift! The “Simpson Sampler” holiday box will be an awesome mix of our pastured poultry, forest raised pork and 100% grass-fed black angus beef. The retail value of this package is over $230.00, but we are offering it at over a 15% discount with free delivery for $199.00. However, we are only making 10 of these available! 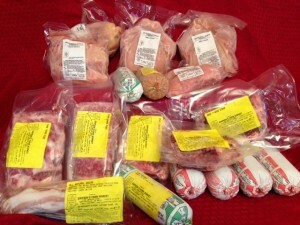 Check out our “Big Porker” holiday box if you would like a full range of our pork products. The retail value of this package is over $170.00, but we are offering it at over a 15% discount with free delivery for just $149.00. Check out our “Little Porker” holiday box if you would like a wonderful variety of our pork products, but in a smaller package. The retail value of this package is over $115.00, but we are offering it at over a 15% discount with free delivery for just $99.00. However, just like the other holiday boxes quantities are limited and we’ll only make 10 of these available! For all packages we are also expanding our normal delivery area to all of greater Indianapolis including Zionsville, Carmel, Fishers, Noblesville, Lawrence, Wanamaker, Avon, Brownsburg & Plainfield. We will also include all of Johnson County, Morgan County and the greater Bloomington and Elletsville areas as well. Please note that all package sizes listed are approximate and not every box will be exactly the same. All boxes will include the number of packages indicated and will meet or exceed the retail value listed. Deliveries will take place between 10am-6pm on either Wednesday, December 14th or Wednesday, December 21st. You can also choose to pick up your box at the Indy Winter Farmer’s Market on December 17th or at the Bindford Buying Club on December 17th. Finally, you may pick up your box at the farm any day (on or before December 22nd) by appointment. Ready to order? Simply e-mail us at info@simpsonfamilyfarm.com or use the contact form on our website to reserve your box! You can then pay us with a check or cash upon delivery, or we can send you a secure electronic invoice to pay online. Just indicate your preference in the e-mail along with your phone number, desired delivery date, IWFM pickup or on farm pickup date and time. If you select delivery, please include your street address as well. We’ll then get in touch with you to wrap up the details. Who doesn’t love a great roast beef? This is a super tasty, super easy recipe that our family loves. And the best part? The thinly sliced roast beef sandwiches you can make the next day! 1. In a small bowl, mix the paprika, salt, garlic powder, black pepper, onion powder, oregano, and thyme. Stir in the olive oil and allow the mixture to sit about 15 minutes. 2. Preheat oven to 350 degrees. Line a baking sheet with aluminum foil. 3. Place roast on the prepared baking sheet and cover on all sides with the spice mixture. 4. Roast about 50 minutes to 1 hour in the preheated oven, or to a minimum internal temperature of 145 degrees. Let sit 15 minutes before slicing. 5. Drain pan drippings into a small saucepan and simmer to reduce. Add flour or small amount of arrowroot powder to thicken if desired. Serve over the top of sliced beef and enjoy. We absolutely love this simple recipe that can stretch a pound of steaks into a meal that will feed four people. Be sure to use fresh, local greens from the farmer’s market to make this recipe the best it can be! 2 sliced red, orange or yellow peppers. Sprinkle steak with fajita seasoning and let sit for 2-3 hours at room temperature. Grill steak to desired doneness (we suggest about 3-4 minutes per side on a grill, medium rare). Slice steak into thin strips and reserve. In a skillet, saute peppers and onions in oil until veggies are tender. Mix all ingredients together until well blended and chill 3-4 hours before serving. Place grilled veggies over fresh salad greens, followed by 4-8ozs of steak and fresh grated cheese. Drizzle with dressing and enjoy!